Alyse Galvin, who is running against Rep. Don Young (R) for Alaska's at-large congressional seat, went to a recent Anchorage Chamber of Commerce debate loaded for bear. 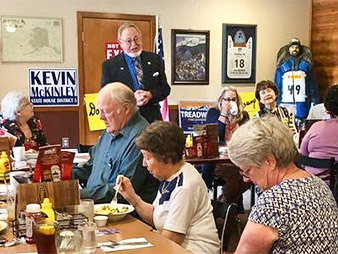 At a luncheon featuring Galvin, Young and seven candidates for state Senate, she blasted the congressman's voting record and his support for Trump administration policies. Galvin called Young out for being "missing in action" as President Trump's trade war with China takes an economic toll on Alaska's seafood industry and hikes steel prices for repairs to the Port of Alaska in Anchorage and plans for the state's proposed natural gas pipeline project. Noting that Washington, D.C., has agreed to provide $12 billion in aid to Midwestern farmers affected by Chinese tariffs, Galvin asked, "Why hasn't Don Young proposed an aid package for our fishermen?" Young countered the trade war probably won't be detrimental to Alaska businesses. "I think you're going to see a public meeting between the president and China" that will solve those problems, he said at the debate. "There will be a negotiation. There will be a solution to this problem," Young argued. "The fishermen directly impacted right now — we are working to make sure that doesn't happen." Galvin won the Democratic primary for the right to face off against the 23-term incumbent but identifies as an independent. Should she win and come to Washington, Galvin says she will caucus with Democrats, much like Sens. Bernie Sanders of Vermont and Angus King of Maine, but will remain unaffiliated. Her campaign made clear she will not be supporting House Minority Leader Nancy Pelosi (D-Calif.) for speaker and instead wants "new leadership." During the chamber event, Galvin spent nearly all her time at the microphone attacking Young's record. 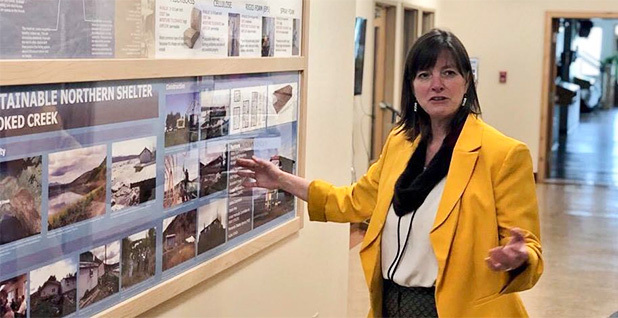 She called on Congress to provide funding needed to rebuild the aging Port of Alaska, which handles millions of tons of cargo each year and provides a strategic seaport for the military. The fact that funding is an issue at all, she said, illustrates how far from power Young really is, despite his years in Congress. "His campaign would like you to believe that he is still Don Young. And there was a time back when he was chairman of the [House] Transportation Committee when we wouldn't be worried about funding for the port," Galvin said. "But we must face the fact that ... he can't ever be chairman of the Transportation Committee again. He is termed-out of any powerful position." As Galvin spoke, Young, 85, shook his head and scowled. At one point the Alaska Republican, who has a well-earned reputation for making caustic remarks, took his own shot. "I am amazed when I listen to my so-called opponent when she's already nasty," Young said. "I thought this was going to be a civilized campaign. ... Right now what I'm hearing is not much about what [she] can do, it's about how bad I am." Could a blue wave hit Alaska? The debate was evidence that this fall's congressional election in Alaska could be different than the political contests Young has faced in recent years. Young has held Alaska's House seat for almost half a century and is used to winning as much as 74 percent of the vote (E&E Daily, Jan. 23). The closest race Young's had in the last 10 years was in 2008 against Democrat Ethan Berkowitz, who is now mayor of Anchorage. In that contest, held the same year Barack Obama was elected president and longstanding Sen. Ted Stevens (R) was defeated amid allegations of corruption, Young got 50 percent of the vote against Berkowitz's 45 percent. But Galvin, 53, is a different kind of candidate. A well-organized, nonpartisan education activist, Galvin has built a grassroots network of more than 700 volunteer workers. Her campaign report to the Federal Election Commission says that as of Sept. 1 she raised $600,000. But at the Anchorage Chamber of Commerce debate, Galvin announced she had $900,000 on hand, primarily through individual contributions from Alaskans. Young's Sept. 1 campaign report disclosed he'd raised $800,000, with more than half of the contributions coming from outside of Alaska. His campaign office declined to provide more recent campaign contribution numbers. Since entering the race early this year, Galvin has worked hard to build name recognition, in part through Facebook and other social media outlets that have become ubiquitous in urban and rural Alaska. If Galvin wins the election, she promises to hold regular live Facebook chats with constituents. By contrast, Young posts an occasional message on his office and campaign social media accounts, but he's been critical of widespread cellphone use. Galvin might also benefit from increased political activism among supporters of Alaska's Stand for Salmon ballot initiative, a controversial salmon protection measure that's opposed by the resource industry, unions and some Native corporations. Stand for Salmon is backed by a wide cross section of Alaskans, including a block of young progressives who probably wouldn't vote in a midterm election. Those activists could cast their ballots for Galvin, although she hasn't taken a formal position on the initiative, and Stand for Salmon isn't supporting any candidates. Despite Galvin's successful fundraising and active grassroots campaign, election analysts suggest she has a tough road ahead of her. Political website FiveThirtyEight gives Galvin a 2 out of 7 chance of defeating the dean of the House. Shortly after Galvin won the Democratic nomination in Alaska's Aug. 21 primary, The Cook Political Report changed its prediction on the Alaska congressional race from "solid" Republican to "likely" Republican. Kyle Kondik, managing editor of Sabato's Crystal Ball, noted that Alaska is at its core a "right-of-center state." "The question is, how vulnerable is Young, and will a congressman known for controversial statements make some sort of mistake down the stretch that puts him in more jeopardy?" Kondik said. "All of this said, I would rather be Young than Galvin in this state and in this race," he said. Galvin won Alaska's Democratic primary thanks to a new rule opening the party's primary to outside candidates. But in interviews, Galvin identifies herself as an unaffiliated independent. That's significant because almost 60 percent of Alaska's registered voters are registered as nonpartisan or undeclared. University of Alaska, Fairbanks, political science professor Amy Lovecraft observed that Galvin's political advertisements don't mention that she's running on the Democratic ticket. "She clearly wants to position herself outside of — or in-between — both parties," Lovecraft said. "Because she hasn't held an office, she has no 'political' track record as a member of any party." But Young continues to have strong support among Alaska's conservatives, the oil and mining industries, powerful Native corporations, and some Native communities. Lovecraft noted that Young enjoys the benefits of incumbency. Overall, Alaskans "look at their member of Congress as the reliable lifeline to Washington," she said. During the last nine months, Galvin has taken her campaign on the road, driving through Alaska in her family's 20-year-old recreational vehicle decked out with "Alyse Galvin for Congress" signs. She's running an aggressive grassroots campaign that includes dozens of town halls meetings throughout the state, many of them held in her RV. She estimates that she's traveled about 4,000 miles along Alaska's road system since she began campaigning. "A lot of people from outside [the state] don't really understand how big Alaska is. So I tell them I've gone the equivalent of driving from New York to Los Angeles and halfway back again," she explained in an interview with E&E News. She's also flown to Alaska Native villages and communities that are located off the state road system. Galvin says she's running for Congress because she believes there is a power vacuum in Alaska's congressional office. "Alaskans all appreciate Don Young's 45 years of service to the state, and so do I," she said. "But it's time for a change." A spokesman for Young's campaign did not return several messages left seeking information and comment. Galvin initially got involved in public policy debates about five years ago when she helped form and lead a nonpartisan coalition called Great Alaska Schools, which focuses on public education funding issues. The group, which grew from 40 to 4,000 members, was instrumental in protecting Alaska's education budget during the years when the state faced severe budget deficits. In 2017, when President Trump nominated Betsy DeVos as Education secretary, Galvin helped rally Alaska opponents in a successful lobbying campaign to convince Sen. Lisa Murkowski (R-Alaska) to oppose the nomination. DeVos was ultimately confirmed when Vice President Mike Pence broke the tie in the closely divided Senate. Galvin said her activism on education "helped me to understand how important it is that we have leaders behind the door who are looking after Alaska first. Leaders who are able to drop the partisan battles and get things done. Someone with bold tenacious vision ready to move us ahead." Galvin's family migrated to Alaska during World War II and settled in the Anchorage area. She left the state to attend the University of California, San Diego, working her way through college by doing a variety of odd jobs. After earning a Bachelor of Arts degree in political science, Galvin and her husband Pat returned to the Last Frontier to start a family. They have four children, the youngest just entered college. While raising her family, Galvin was a public school teacher, owned a daycare center and managed a large hotel. Her husband, Pat, served as the petroleum land manager in the Alaska Department of Natural Resources under Gov. Frank Murkowski (R) and as Alaska state revenue commissioner under Gov. Sarah Palin (R). He's currently the chief commercial officer at Great Bear Petroleum, a small oil company based in Anchorage. Galvin lines up with Democrats on many social issues, but she leans conservative on others. She is a supporter of the Second Amendment but favors strong rules governing background checks for gun sales. Like most Alaska political candidates, Galvin supports oil and gas development in the Arctic National Wildlife Refuge and sidesteps questions on whether Congress should reimpose environmental protections. "ANWR is open now," she noted. "Alaska is a resource state and we need jobs." But she emphasized the need for strong oversight and careful development. Galvin is more concerned about federal proposals to open oil and gas development in the Arctic Ocean, warning that the industry still doesn't have the technical knowledge and the readily available equipment needed to clean up any potential oil spills. In the weeks before the November election, Galvin plans to continue traveling across the state to introduce herself to more Alaska voters. On the road, Galvin will be hammering home the message she brought to the Anchorage Chamber of Commerce debate. In a recent Facebook posting, Galvin said her aim is to "remind voters of Don Young's disastrous Congressional voting record — one that includes stripping healthcare coverage from thousands of Alaskans, and risking our nation's fiscal health with a bundle of tax cuts and giveaways for his corporate donors."